There's a lot of confusion and misinformation out there about true bypass vs buffered pedals. I'm going to try to clear that up, but without getting too deep into the technical bits. I'll structure this as a Q&A session. True bypass is a design for turning off an effect pedal where the effect circuitry is completely taken out of the signal path of the guitar, so when bypassed it is effectively just a wire running from the input to the output of the effect. Buffered bypass is a design in which the guitar signal still goes through a "buffer" circuit when the effect is bypassed. A standard passive guitar pickup has a high-impedance, low-strength output. (This is as technical as I'm going to get.) The buffer effectively "strengthens" the signal by converting it to low-impedance. Is true bypass better than buffered bypass? It's not a simple A>B situation. In some situations true bypass is better, in others it's worse. I'll try to explain those scenarios in the answers to other questions. True bypass has no appreciable effect on your tone, while a buffer circuit will impart some coloration on your tone even when the effect is bypassed. Although the amount of coloration may be very small. So true-bypass is better then? No. True-bypass does not erode your tone, but it also does nothing to combat your cables eroding your tone, which is exactly what buffers are designed to do. First, you have to understand that cables have a pretty significant effect on your tone when the cable lengths are long (say, 15 feet or more). Over long cable runs, a passive guitar output signal will lose high-end and get kind of fuzzy/loose sounding on the low-end. The same thing happens if the signal is split, like to a tuner or a second amp. Finally, the high impedance signal of a passive guitar output is susceptible to electrical interference. Buffering the guitar signal will enable it to run over very long cables (or split to multiple destinations) without tone suckage from the cable itself, and make the signal less prone to interference. So buffered bypass is better then? No. Not always anyway. The buffer circuit will leave its own imprint on your guitar tone. Basically, any circuitry adds some amount of coloration on the signal. With buffers, the coloration is usually negligible although those with really sensitive ears can probably discern it. However, if you run a lot of pedals with buffered bypass, then you get the cumulative tone coloration of all those pedals on your sound, and with enough pedals even players without sensitive ears can hear it. So what is best then? For short cable runs, using all true bypass pedals is fine, maybe even preferably. When I say "cable run" I mean all the cabling between your guitar and amp, including patch cables. And by "short cable run", my rule of thumb is about 15 feet or less in total length. For longer cable runs, you'll probably benefit with some buffering. How much is "some buffering"? Ideally, you'd have one buffer at the beginning of your pedalboard (perhaps the first pedal has a buffered bypass, or maybe the first pedal is a dedicated buffer box), then all the other pedals would be true bypass. That way, you're getting a strong low impedance signal to drive your signal chain without tone loss, but you're not suffering any egregious cumulative tone coloration from multiple buffers. OK, so one buffer at the front, and the rest true-bypass? That's ideal for a small number of pedals (say, 5 or fewer). If you have a lot of effects pedals, it's a good idea to have a buffer at the end of your pedalboard as well, effectively book-ending your effects with buffers. That final buffer will make up for any cumulative tone loss through the pedals. Once again, you could accomplish this by using a pedal with buffered bypass or a dedicated buffer at the end of your pedalboard. Crap, some of my "in between" pedals are buffered. What should I do? Don't sweat it. Front-ending or book-ending with buffers is ideal, but it's not a hard requirement. Unless you have bat ears, an extra buffer or two in the signal path is not going to appreciably hurt your tone. Easy enough, anything else I should know? Yes, one more thing. Germanium fuzzes don't like buffers! 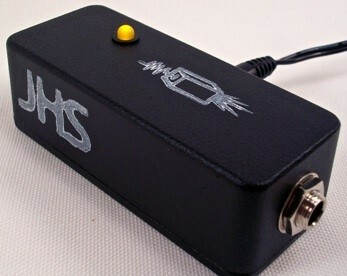 If you have one of those, put it at the beginning of your pedalboard before the buffer. Where can I get a standalone buffer pedal? First, be aware that any pedal with buffered bypass will act as a buffer by simply putting it in your signal chain and leaving it off. Also, most effects (even true-bypass effects) have a low impedance output when they're turned on. So any effect that you leave on all the time is effectively acting as a buffer. So it's likely you don't actually need a standalone buffer. I don't have a standalone buffer. I have a compressor pedal second in my signal chain and a reverb last. The compressor has buffered bypass and the reverb stays on all the time, so voilà, bookended buffers! But let's say you do actually need a standalone buffer. Oddly, they're kind of a specialty item made primarily by boutique builders. The ones I've found are made by Analogman, Empress, JHS, MXR/CAE, ScreaminFX, and Suhr. But don't treat this list as exhaustive; I'm sure there are many others.